Folding bikes are becoming increasingly popular for commuting and traveling, and bike manufacturers have taken notice. A few years ago, someone who wanted a folding bike would have had only a handful of choices built almost exclusively for urban streets. Now, there are dozens of folding options available targeting many different riding styles. Whether you’re looking for a dedicated commuter or a do-it-all bike that can take you from the office to the trails, there is probably a folding bike made to fit your needs. If you’re looking for any bike, the first thing you should do is figure out what kind of riding you want to do. While any bike can be used on almost any surface, specialized road bikes, gravel bikes, and mountain bikes exist for a reason. Someone interested in long, high-speed rides on tarmac may be happier with a nimble road bike than a sturdier full suspension downhill bike. Adding the ability for a bike to fold increases the number of things to consider when choosing the right bike for your needs. Ask yourself why you want a folding bike. Is it because you want to ride your bike into the office and fit it under the cubicle after your commute? Maybe you don’t have space to store your bike in your apartment in between riding sessions? Or maybe you want a bike that you can bring with you on a plane without paying exorbitant bike luggage fees? If storing your bike at work or at home is an important consideration, you want to figure out how much space you have for your folded bike. Some folding bikes collapse smaller than others, so make sure you know the folded dimensions of the bike you choose. You may want to transport your bike while it is folded. For example, traditional bikes are not allowed during rush hour in many underground or rail systems. To get around this, you can ride a folding bike to the subway or metro station and fold it so you can carry the bike as luggage. In this case, you want to consider how easy it is to carry the folded bike. Some folding bikes require the front wheel to be removed. Not a great option when you’re navigating crowded escalators and trains. Other bikes are designed with folded maneuverability in mind. Some Tern bikes can be folded in a way that converts the seat post into an extended handle to roll the bike around. If you want to fly with your bike, consider the cost of travel. Airlines charge extra baggage fees for traditional bike boxes and carrying cases. Some folding bikes collapse into a small enough package that they can avoid the bike fee and the large baggage fee. Brompton bikes can be packed into a hard sided case that looks almost like traditional luggage. Whether you’re carrying your bike during your commute or while it’s packed into a suitcase, the lighter the bike the easier it will be on your back. It’s true that folded bikes are usually on the heavier side compared to traditional frames, but their weight varies considerably. The folding bikes we looked at in this comparison range from 20 lbs to almost 60 lbs. When you’re riding, a heavier bike means you have to expend more effort to get your wheels rolling. This matters more if you’re competing for speed, but even a short commute can be affected by an extra 10 lbs of bike. 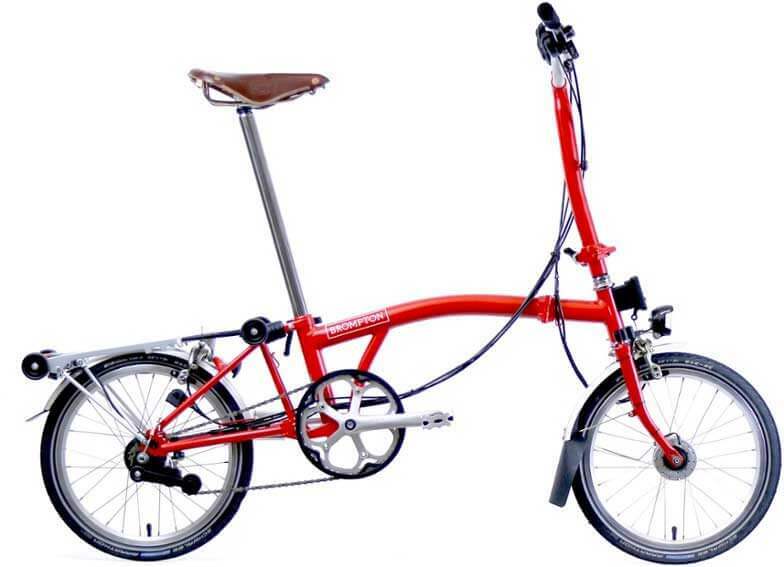 Folding bikes come in a range of wheel sizes from the 16” Bromptons to harder to find 26” and 700c options. In general, larger wheels are more stable when steering, but there are other considerations. Many people prefer smaller wheels on a folding bike because they are easier to pack. Certain tires only come in a limited selection of wheel and rim sizes, but the sizes of the bikes featured below have a range of tires available. E-bikes have risen in popularity along with folding bikes, so much that their combination was almost inevitable. Adding a pedal assist motor to a folding bike may give you your perfect commuter bike. Some people claim that the folding ebike is a car-killer in urban communities. Pedal assist motors give you extra power on each pedal stroke. This can help you get over the last big hill or overpass on your road to the office. It can also help you carry the extra weight of cargo or kids on your rear wheel. Electric motors aren’t for everyone, though. They significantly increase the weight, cost, and upkeep of a bike. Most folding bikes are used for commuting, so it’s worth considering bike features that will make commuting easier for you. Fenders are always a great addition if you think you will ever be stuck in the rain. There’s nothing worse than a wet and muddy line up your back as you walk into the office. It’s likely that you’ll be riding in the dark at some point, so lights are a must on any bike. If you don’t want to worry about charging yet another thing, a hub dynamo system can power your lights as you pedal. Rear racks help carry your gear and may help you replace your car for short trips. You can panniers and trunk bags to carry your things. Tern folding cargo bikes can even fit child seats for up to two kids. With so many options to choose from, it’s hard to know where to start. 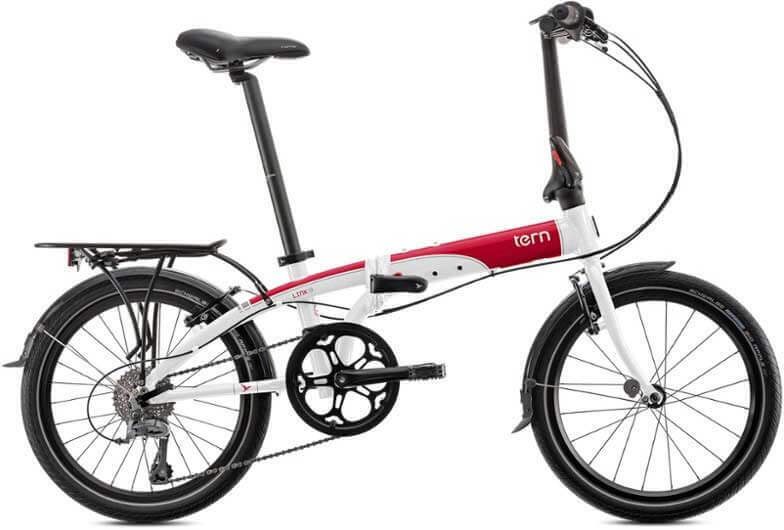 If you’re looking for a great folding bike to get around town, Tern and Brompton are reliable brands you should consider. Between them, they make a variety of great folding bikes, electric folding bikes, and electric cargo bikes. We’ve compared 10 of their top models to help you decide which one is right for you. Tern’s two electric cargo bikes have a non-folding frame design that can fit up to 400 pounds of rider and cargo. They fold at the handlebar and have a collapsing seat post, making it easy to store the bike under a table or shelf where a traditional bike would not fit. The wheelbase does not get smaller when the bike is folded, which is a good thing for strength but is something to consider if you need a smaller folded dimension. The collapsible seat post and folding handlebars mean that the bike will fit most riders, from 4’8” to 6’4” tall. The large integrated rear racks on each bike come with panniers. They can easily accommodate 2 children with Thule Yepp Maxi child seats or one adult with a Thule Yepp Nexxt Maxi seat. The Tern GSD S10 model comes in matte silver blue and in orange. 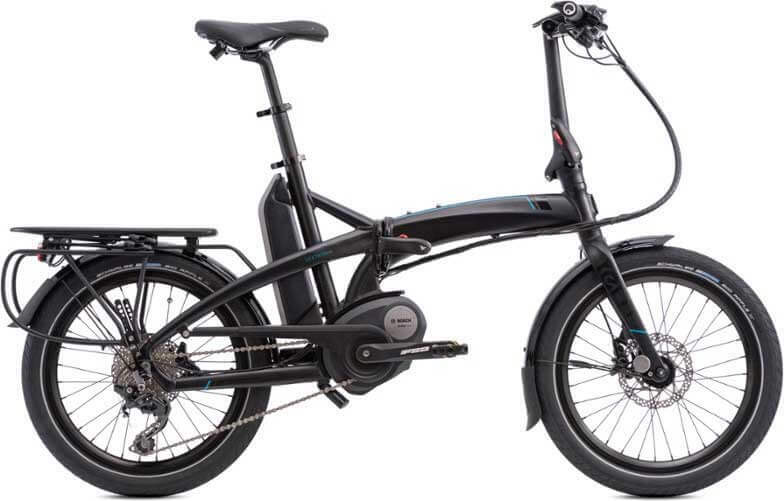 It is a sturdy folding ebike that uses traditional Shimano shifters and rear derailleur with a Bosch Performance Line 250 watt electric motor. If you’re carrying kids or other important (and heavy) cargo up hills with the pedal assist, you want to make sure you can safely come to a stop. Tern made sure to include a Magura MT-4 braking system with 4 piston hydraulic brakes to support the heaviest load. As you can see, this model is for people who take their bikes seriously and only want the best that money can buy but at a cheaper cost. The Tern GSD S00 is an upgrade from the S10 with a Bosch CX drive that can handle hilly commutes under load. The Enviolo hub uses a twist shifter that is different from the staged Shimano shifting in the S10. There aren’t any perceptible steps in gears, so you don’t have to worry about choosing the right level. Just twist the grip until the pedal resistance is what you want. The GSD S00 also upgrades the brakes to go along with the higher torque drivetrain. As you can see, this is a great bike if you are looking for something a bit more high-end and premium than the S10 model mentioned earlier. If you are hauling yourself to work, a traditional folding bike might be perfect for you. Consider the weight, handlebar, wheel size, and gearing that matches your riding style. If you really can’t choose, there’s nothing wrong with picking a bike that comes in your favorite color. Brompton bike components can be identified using the model numbers, which is helpful if you know what you’re looking for. 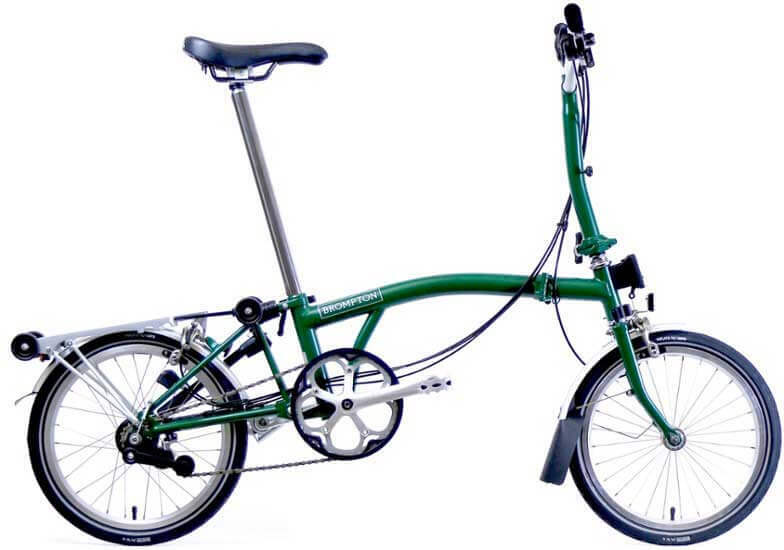 The Brompton S6L-X uses sporty “S-type” handlebars, has 6 gears, comes with mudguards, and includes titanium parts to lighten the frame and components. This model is the lightest of the folding bikes on our list. 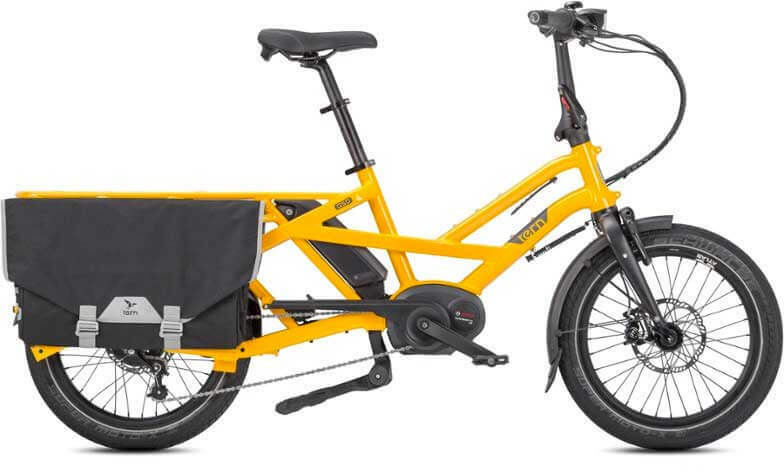 As will all Brommies, it has 16-inch wheels and folds at the frame so that the front and back wheel can easily be rolled using the seat post as a handle. The seat post also collapses to make a compact folded bike. The Tern Node D7i has 24” wheels, the largest wheels of any bike on our list. For perspective, older mountain bike and cruiser bikes have 26” wheels. Road bikes have 700c wheels, which are about 29 inches. If you want a folding bike that handles like a traditional bike without the larger size, the Tern Node D7i is a great buy. The Node D7i is built to be low maintenance with a 7-speed internally geared hub. Tern took your personal maintenance into account too by adding thoughtful extras to keep you clean while you ride. Fenders are a must on any wet ride to the office, but Node takes it a step farther with a chain cover to protect you from the dreaded greasy chain tattoo and dirt splatter. 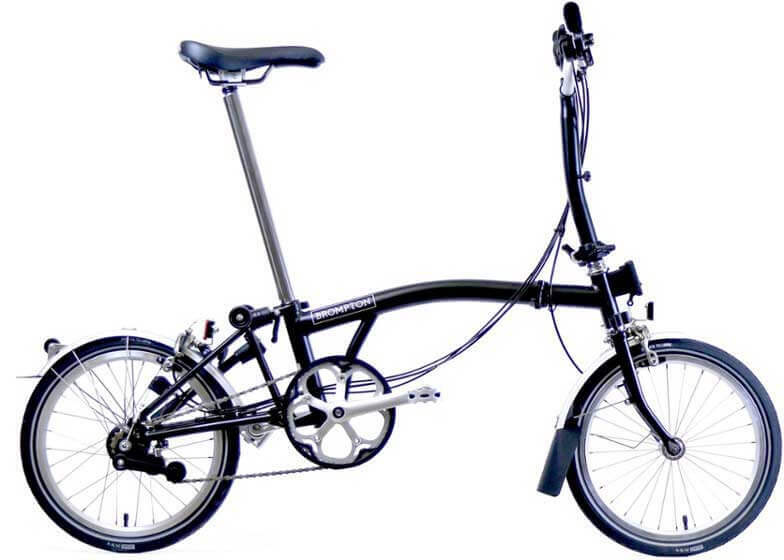 The Brompton M6L comes with a mustache bar that gives you multiple hand positions on a comfortable neutral ride. Like the S6L, it has 6 gears and comes with mudguards. This black edition uses specially selected all-black components for a sleek look. The chromoly steel frame is hand-brazed in London, where the Brompton World Championship racing event takes place every year among committed commuters. The Tern Link D8 is a do-all, go-everywhere bike. Its 20” wheels are small enough to help the D8 travel with you on your vacation. The rear rack helps you carry your gear around when you get there. The 8-speed drivetrain gives you great range for city riding. It’s equipped with fenders and a BioLogic Como DLX saddle to make your commute comfortable even in the rain. 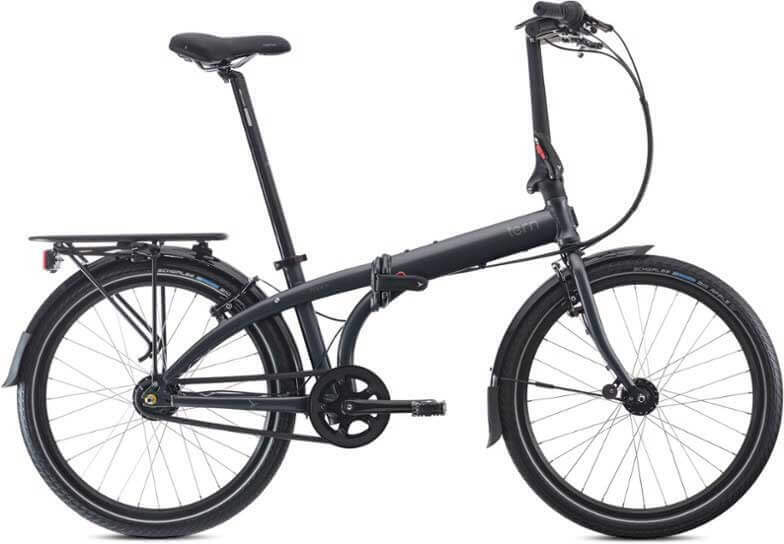 The Brompton M6L folding bike is like the M6L Black edition folding bike in almost every way. Instead of all-black components, the standard M6L uses chromed and aluminum-silver parts to add an additional dimension to the black frame, stem, and fork. The neutral “M” handlebar is the most popular of the Brompton handlebar options, as it provides a comfortable ride that can be adjusted by angling the bar to suit your reach. 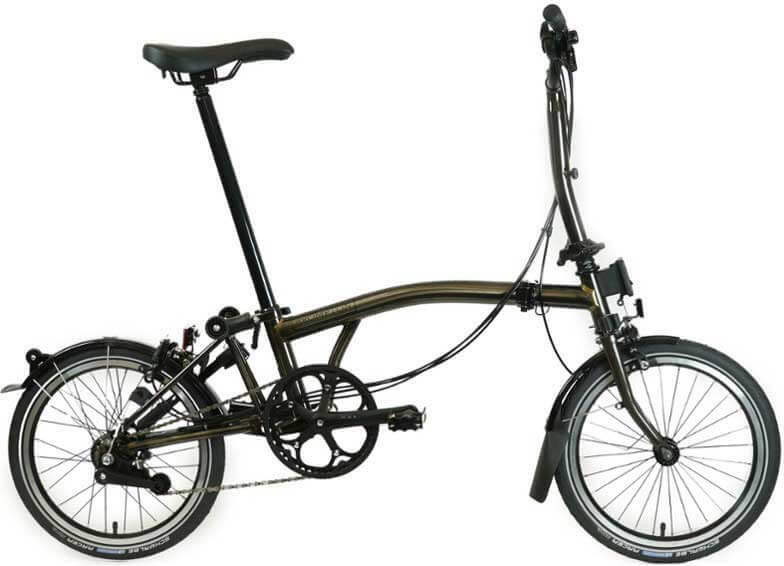 Unlock your commute with the fast and versatile Brompton M6L folding bike. A compact fold paired with the speed and stability of a full-size bike make it ideal for weekend escapes and urban rides. The Brompton M6R adds a rear rack to the traditional Brompton setup. The 6-speed bike still uses the “M” style handlebar favored by commuters and fitness riders alike. The rear rack can carry a surprisingly large load. It also features small wheels that help you push the folded bike around without damaging the rack surface. Folded size: 23 x 22.2 x 10.6 in. 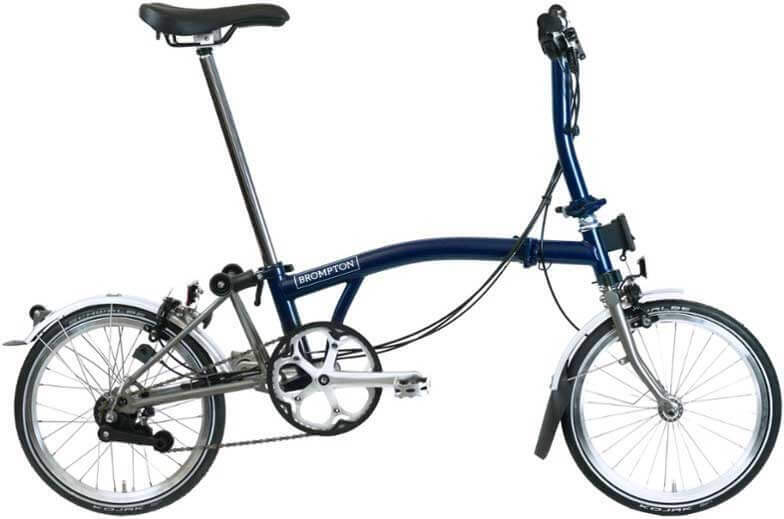 The Brompton H6R is focused on riding comfort. The “H” style handlebar provides an upright ride like any cruiser, great for a casual spin around town. The Brooks B17 saddle is a perfect fit for a relaxed ride. Ride as many hours as you’d like, since the Shimano Dynamo hub will power your lights as you pedal. A rear rack can carry your picnic basket or day’s shopping. A tool kit is even included to help set up and maintain the bike. E-bikes are becoming more mainstream for people who want to ride their bike but don’t necessarily want to work up a sweat every time. They are especially good for people who commute long distances or in hilly terrain. It’s one thing to ride your bike on a beautiful spring morning. Adding a little pedal assist can be a much-needed boost when you have to get home at dust after a long, tiring day. The Tern Vektron S10 is a folding eBike that hits every mark. Because it folds, it is easier to store in the office and under your desk where it is less of a target for thieves. 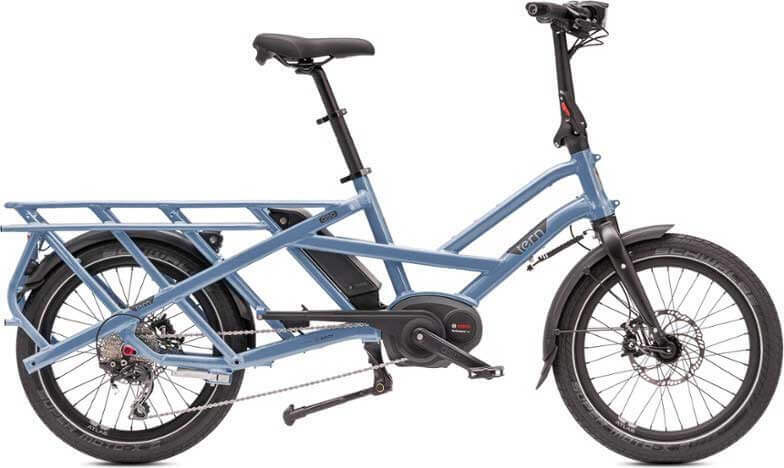 Unlike the cargo folding ebikes, the frame of the Vektron S10 folds, making the bike fit in shorter spaces. If you want to get the bike on a subway or down your office hall, the seat can be used as a handle to wheel the bike around. 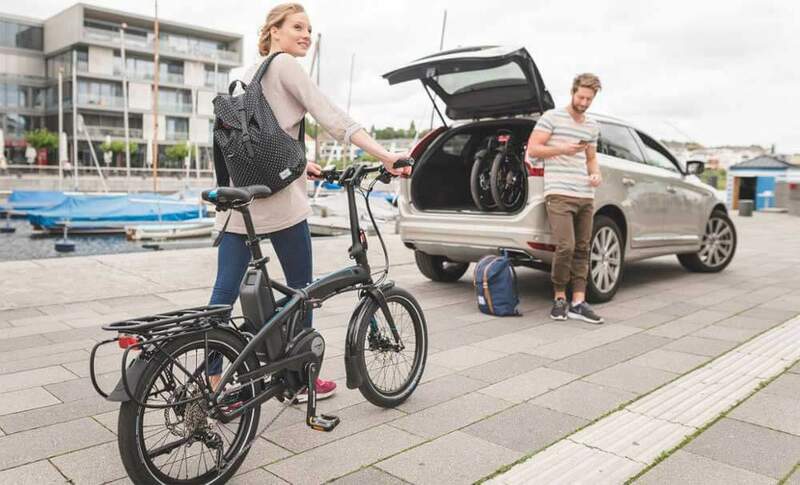 The Bosch Active 250 watt drivetrain has a max speed of 20 miles per hour and can help you pedal for 40-80 miles per charge. The 10-speed Shimano Deore groupset can be used as a traditional bike when you don’t want to turn on the pedal assist. With the extra power, you may be tempted to stay later at the office. That makes the integrated Valo lighting system particularly handy since you don’t have to worry about remembering to pack a light. The rear rack can fit Maxi Easyfit or Junior Easyfit Yepp child seats. While all of the above bikes are great choices for anyone shopping for a new folding bike for everyday use (commuting, travel, exercise, etc. ), we know that they don’t fit everyone’s budget. So, if you need something in a cheaper price range, then check out our recommendations for cheap folding bikes under $500.